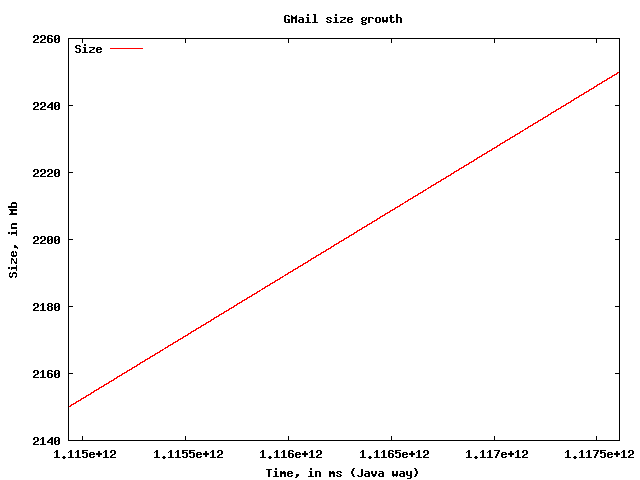 As many users have noticed, GMail decided to celebrate its first anniversary starting incrementing its mailboxes size. The array CP defines the size (second column) of a mailbox at a given time (the first column). The function updateQuota() does all the work for counter. First of all, it tests the time-frame in respect to CP and sets i to the corresponding line of CP: if now is less than every time in the array, than waits another second for more lucky; if now is over every time in the array, than simply update the code of quota; if none of the above cases happened, than starts the interesting part. At this point, we can be sure that now is between i and i-1; starting from that, updateQuota() calculates the size of the mailboxes following a linear growth from CP[i-1] to CP[i], updating the counter every 50ms. Note that I've done nothing different from reading the code of the GMail home page. the change is in the timeout after the update of capacity; this leads to a "less flickering" counter. If you can remember something from high school math, the growth is linear because ( time-ts ) / ( tf - ts ) factor it's a linear function of time, modified only by constants (so that the trend is not modified). 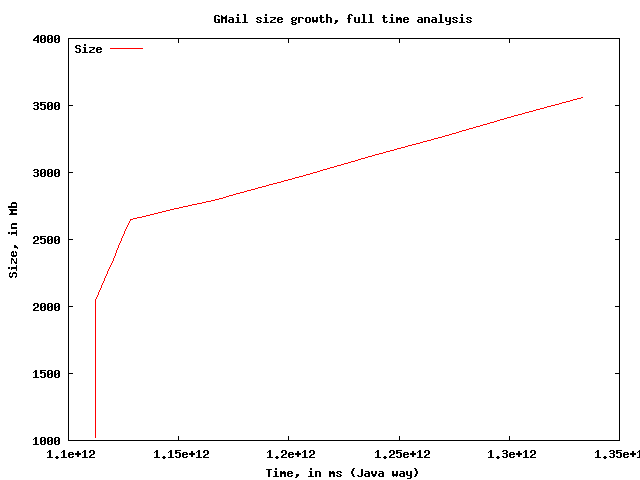 After a real fast growth in intial phases, mailboxes size starts to grow slower, and these days even slower. What said is valid at time of writing, 29 April 2006. Every question, suggestion or others are welcome!